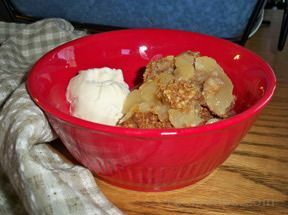 Tender apples topped with a crunchy oatmeal and brown sugar topping. Perfect in the fall served warm next to vanilla ice cream. 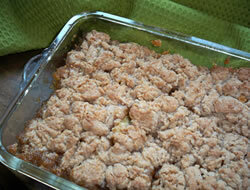 Recipe can easily be doubled and baked in a 9x13 inch pan. Arrange sliced apples in greased square pan. Mix remaining ingredients in a bowl and sprinkle over apples. 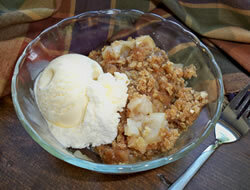 Bake until topping is golden brown and apples are tender, about 30 minutes. Serve warm, with cream or ice cream. NOTE: Can substitute other fruit such as apricots, berries, cherries, peaches or pineapple for the apples; if doing so, use a lesser amount of brown sugar. "Kids loved it. I prefer a little flour, sugar and cinnamon mixed with the apples so there's a little sauce with the apples."